For the past couple of weeks we’ve been focused on Disney’s social PR issues. This week as they remain in a holding pattern in a will they/won’t they make a declarative statement on the withdrawal of the New Merida design, we turn our focus to one of the most fascinating collisions of a socially vocal community and a Brand; the Nutella World Day debacle. If you follow Social Marketing blogs you hear an awful lot about buzz words like ‘engagement’ and building ‘brand advocacy’. The holy grail for any active social brand is to create or tap into brand evangelists who are so passionate about a product that they will willingly speak far and wide on social networks about its benefits. At ArCompany we have been promoting a different way of using Influence Marketing and determining who the true influencers are; they’re not necessarily those with large followings and noisy blogs. With the launch of the book, you may have caught one of the many talks and interviews Danny Brown has given where he advises companies to spend more time and resources to understand their customer’s behaviors and the situations that influence them. We forsee a shift in the way CMOs and Marketers seek out the infividuals who can inspire behavioral changes and cause customers to purchase. Many companies search for these Influencers and try to build communities around them; for a rare few brands, these passionate Influencers are already out there spear heading brand evangelicism on there own, without ever being asked. Why all the fuss about Nutella? If you live in the US it is possible that you are not familiar with Nutella, although its been imported to the US from Italy for over 25 years. It’s a hazelnut and cocoa spread that is wildly popular throughout Europe, Canada and other parts of the world. 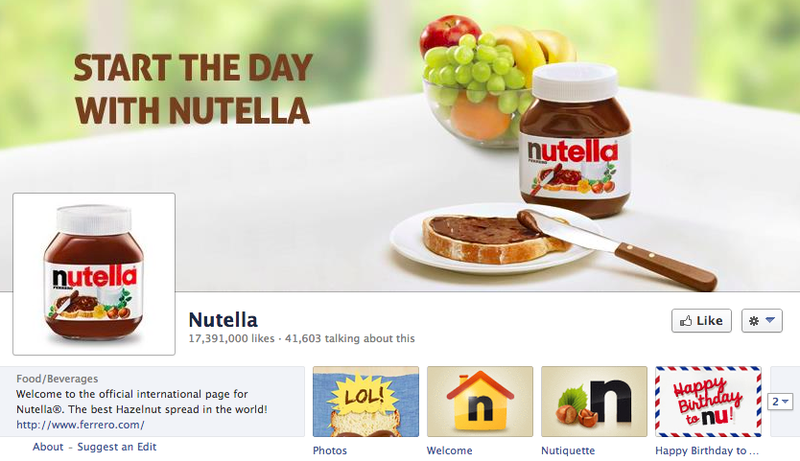 Nutella the brand has long had a passionate following; for evidence, check out their Facebook Page and its 17 million+ followers. As of the writing of this post, when you go to said page the first post you’re met with is the following: Positive direct contact between Ferrero and Sara Rosso, owner of the non-official Nutella fan page World Nutella Day, has brought an end to the case. Ferrero would like to express to Sara Rosso its sincere gratitude for her passion for Nutella, gratitude which is extended to all fans of the World Nutella Day. The case arose from a routine brand defense procedure that was activated as a result of some misuse of the Nutella brand on the fan page. Ferrero is pleased to announce that today, after contacting Sara Rosso and finding together the appropriate solutions, it immediately stopped the previous action. Ferrero considers itself fortunate to have such devoted and loyal fans of its Nutella spread, like Sara Rosso. If you are stumbling onto the Nutella Facebook for the first time you may not know that Ferrero is the multinational company that owns the Nutella brand and was founded and is still run by the Ferrero family. Sara Rosso is an American blogger living in Italy and a super fan of Nutella. She is also the founder of “World Nutella Day”. On this Rosso-created holiday, each February 5th lovers of Nutella the world over blog, post pictures and videos, and express their passion for the product online. And so begins one of the strangest tales of a company fumbling their PR and the role social media played in the story. If you were the head or marketing director of a business and you woke up one day to find that a fan had organized a day solely to celebrate your product, one would think you might be… well… a little GLEEFUL. If you also discovered that the same fan had created an online worldwide celebration of your product and convinced thousands of others to particpate you would probably see it as manna from heaven. …consider it to be an unauthorized use of their intellectual property and trademarks, the Nutella logo and brand. What Ferrero wanted was for Rosso to take down her website and Facebook Page, and to stop using the Nutella name and logos. It goes without saying that every marketer and pr expert on the planet was left scratching their head in disbelief at Ferrero’s action. Why on earth would any company squelch this type of publicity? The cynic in me has to ask: was it to bring about even more publicity? Of course I can’t answer that, but if it was the goal, it worked. My experience with these sort of debacles tells me that the folks at Ferrero probably aren’t that brilliant. Nutella Thanks Its Biggest Fan, Founder of World Nutella Day, by Sending Her a Cease and Desist That’s nuts! You get the picture: it was a copywriter’s dream, and the titles tell the story. As I mentioned, Sara Rosso is a blogger, and the founder of World Nutella Day; she is not a PR expert or media whiz. Her reaction to the cease and desist and the fan outrage it spawned, however, was measured, mature, and frankly a case study in how one should handle PR problems. Rosso did not take to her blog to rant about the lack of gratitude Ferrero was showing her community. She didn’t throw her influence and power in their faces. She never released the Cease & Desist letter publicly, and she responded with calm and maturity, stating that she had always had a good collaborative relationship with the company’s employees and that she was hopeful for a resolution. She agreed to follow the letter of the law until one was reached. Not all Nutella fans reacted with the same restraint Rosso showed. This is some sad news. And I actually lost respect and love for Ferrero. You’ve nothing but promote Nutella. They should thank you and send you Nutella for a life time. And not send cease and desist letters. Stupid company. The backlash they’re going to get will be–ahem–nuts. Nutella…more nuts in company management than in every jar. Idiots. The social media reaction on both Facebook and Twitter was fervent, and the online and traditional press could not stay away from the story. Like I said earlier, I doubt that this was an intentional PR mishap, but if it was, it was pure brilliance. Rosso herself believes that this was not a PR stunt, and answers the basics on her own blog. As we’ve stated on other blogs, we admire companies that are willing to admit that they have stepped in it, and who will publicly change their stance. Ferrero, in the face of the online pressure, did just that. Why, after 6 years, did Ferrero send the Cease & Desist? How on earth did they come to the conclusion that the Rosso created worldwide holiday was somehow bad for their brand? What was the C-suite reaction to the online uproar when it first began to explode? What was the discussion that led to the final, smart decision to allow Nutella World Day to continue? Sadly, we never get that fly’s view, and it appears that most of these questions will go unanswered. As far as PR disasters and Social Media Uproars go, this one was tame, primarily due to the way Sara Rosso handled it. We, as marketers, will of course talk about this story for the foreseeable future as a lesson in how not to handle a passionate if renegade fan’s support of your product. We will wonder endlessly why and how the decision was made to initiate the Cease & Desist. But in the end the entire story can only be seen as a positive one for Nutella; the online press put out hundreds of story on their product. Many more American consumers, a market they’ve struggled to really permeate, have taken notice of the product. Sara Rosso is still their number one fan, and all bets are that the next World Nutella Day will be bigger than ever. It’s not often that this space writes about as social pr disaster that has such a sweet ending. And yes, the puns are irresistible. Rather than have a conversation on Google+ AmyMccTobin I’ll bring it here. If I had to bet this is a problem caused by silos. Usually when you see something like this there is not a great connection between legal, marketing and public relations. This had to start with people in legal who were concerned about trademark infringement. If they’d spoken with marketing or pr they could have reached out to the super fan and fixed things without the drama. But the silo got in the way. A little internal conversation before external actions can save a ton of pain for many organizations. RickRice AmyMccTobin I totally agree; it must be silos. But HOW, after so many years, did it ‘just happen.’ HOW could World Nutella Day NOT have been widely discussed among all departments? How could the company not have had a clear position (and a positive one) on the ‘holiday?’ I can see something like this happening if an event just ‘sprung up,’ but not communicating about a world wide product focused holiday and then ‘springing’ this on Rosso??? It has to be historically bad internal communication. AmyMccTobin It could be a new attorney or a new mistake on the FB page but yes, most likely the silos are old and hardened. Perhaps there will be a big upside to this and an organization will learn that internal communication and cooperation are keys to success. RickRice AmyMccTobin Sometimes I think that brands are oblivious to things happening before their very eyes. While social monitoring is now considered somewhat mainstay, many companies still use traditional research methods to figure out what consumers think about them. I have no answers on this one as to why it took so long for Nutella to react (and not in a good way), but I do believe that a large portion of business just don’t pay attention until it smacks them in the face. hessiej AmyMccTobin Or, they just began monitoring it in the legal department and a knee jerked. 🙂 Whatever caused the stop and desist some internal conversation and coordination would have avoided this flap. RickRice hessiej AmyMccTobin I guess that angle I missed in the article is: what kind of monitoring were they doing? I think that a lot of brands don’t monitor fully – they may use Google alerts, but I am regularly fascinated by how many C Level execs of LARGE companies have no idea about the type of listening/analyzing that is available to them… including some of my digitally savvy friends. AmyMccTobin RickRice hessiej I had been following this one too, and it’s pretty clear that Nutella knew, and had been supportive of, WND in the past. And even if it was a new legal beagle that went too far, it points to me that there needs to be an understanding in large businesses that C&D letters on IP matters should be vetted by comms people before being issued. bobledrew AmyMccTobin RickRice hessiej Yes, silos must go in today’s social world. One aspect I didn’t cover in the post is how this would have gone down PRE Social Media days… it would have taken a lot longer for the backlash to appear. Silos are even more dangerous today because the social world moves a lot faster than a silo-ed organization. In your post you describe this as a corporation knuckling down on a humble blogger, but the reality is that they knuckled down on an entire community of passionate fans. THAT’S where the trouble came from. They are BLESSED that Rosso was so level headed. Did this PR snafu even make it onto the MSM or just tech and marketing blogs? My thought about this specific case is that the silos didn’t speak to each other at Nutella. We have to remember that companies are made up of people and that mistakes do happen. Or should companies not be given the opportunity to make mistakes and learn? Solution would be to make sure that proper channels and process is followed. bobledrew karimkanji Hi Bob – thanks for coming by. I can’t find it now but I know that CBS and other mainstream US news channels covered this, as well as Newsday. They just didn’t opt for such corny titles. karimkanji Absolutely brands should be allowed to make mistakes – it’s part of the genesis of this blog series because we at ArCompany got tired of watching brands tarred and feathered by the Social Mob for mistakes; and we also understood that the power of that Mob Voice was OFTEN exaggerated. And as I said in the end of the post, in the end Nutella wins because they got TONS of coverage, including Mainstream – (which I talked about as well) and came to a happy resolution with Rosso. They were, however, very lucky that Rosso showed considerable restraint throughout the process and didn’t fan the flames of resentment. At ArCompany one of our focuses is preparing large organizations to be better Social businesses, and communication across silos, or in fact, breaking down silos is part of what we do. This case was particularly interesting because Nutella acted against their super loyal community by sending out that c&d, and for any social business, THAT’S a head scratcher. Very very interesting article. In my books no matter the reason, whether they actually wanted her to stop the fan page or just wanted added attention, I think they handled it in poor taste. Chris Sohar, we see so many of these cases and MOST Of the time they are due to silos within an organization; it’s one of the things ArCompany starts with – what are the impediments for your company being a truly social business? This threaded convo is confusing me. It’s not consecutive. I KNOW… Amy Vernon ‘s page is like that – is it a setting??? No, Facebook just don’t know how to do threaded comments. Threaded comments are on fan pages and then for individual users with more than 10K subscribers, I was told. Eventually, it will be for all. It is very confusing at first. The worst part? You can’t participate in threaded comments while mobile, so they’re completely borked. I HATE it… who wants to read a conversation BACKWARDS – you want to start from the genesis. Yes, that’s my most overused word of the week, thank you very much. No doubt that you pay attention to the details. I love this stuff!!! So interesting.